Assessment centers can be very helpful to a company’s recruitment process and have multiple benefits, aside from simply improving efficiency. When set up correctly, assessment centers are the top method for hiring great employees. If set up incorrectly, however, assessment centers can result in a significant waste of time and money. Companies need to know how to make the most of these centers in order for them to have a real benefit throughout the hiring process. Even the initial set up an assessment center can be a challenge, especially if the company has never used one before. Below, you’ll learn exactly what an assessment center is and how to ensure your company’s center is successful. Are Assessment Centers Already a Part of Your Recruitment Process? Learn how you can eliminate the administrative challenges associated with traditional assessment centers by upgrading to a digital assessment center today! An assessment center is a single location or event where candidates for one or more job positions are evaluated in-person. Sometimes, assessment centers can be permanent locations where recruiters can bring in applicants for evaluation at any time and for any position they’re trying to fill. An assessment center can also be a temporary location that houses a single recruitment event. For example, if a particular company needs to fill multiple similar roles all at once but doesn’t need to constantly hire new people, it might host a smaller multi-day event which brings candidates to a single location, where they will all be evaluated in groups. The exact logistics of an assessment center vary depending on the host organization and its needs. Sometimes, assessment centers are hosted by an individual company looking to hire for its own open roles. Other times, assessment centers are hosted by recruiters who are hired by multiple companies to evaluate candidates. 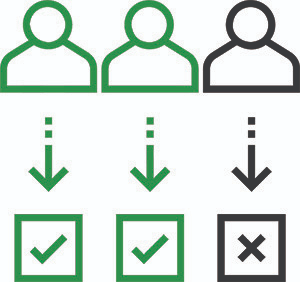 As a general rule, however, assessment centers are used to efficiently evaluate many candidates when the host has multiple roles to fill, whether for itself or for another company. How Do Assessment Centers Work? Each candidate is evaluated according to the relevant criteria set by the hiring organization to predict an applicant’s effectiveness for the available role. No matter the specifics, every assessment center has one thing in common: candidates run through a standardized evaluation process through as many evaluators as logistically possible. Each step of the evaluation process is standardized, both in how it’s deployed by evaluators and how candidate performance is scored. Doing this creates reliable, quantified, hard data performance metrics which make it easier to compare candidates to one another. Each candidate is scored by multiple recruiters to create a meaningful average score. If your organization needs to hire multiple people, an assessment center provides an efficient way of doing so. What Are the Benefits of an Assessment Center? While assessment centers aren’t the be-all-end-all solution to all recruitment issues, it can be beneficial for a multitude of different reasons. If your company is experiencing any of the problems listed below, an assessment center may be your perfect solution. In order to hire the best candidate, organizations can’t rely on a single evaluator. By collecting assessments from as many qualified evaluators as possible, you’ll get the most accurate evaluation of each candidate’s fitness for the job position. While personal biases may still be an issue, the candidate’s overall suitability should not be affected by the bias of a few when evaluated by many recruiters. If every evaluator was allowed to come up with their own method of assessing a candidate’s aptitude for a particular job, it would be a mess. When the time comes to compare the evaluations and each evaluator’s opinion, there will be no similarity between any of the results, making it difficult to provide a fair evaluation. It’s up to the hiring organization to determine what qualities are important for the job and how to best score those qualities. By digesting and standardizing this perspective, an assessment center allows evaluators to score candidates along the same exact criteria, using the same process. Structuring your approach gives evaluators a clear set of guidelines for rating each candidate, and produces quantitative performance scores that can be averaged out and compared. Creating a standardized evaluation system and processing each candidate through multiple evaluators creates a more efficient hiring process. However, no matter how efficient the process is, it’s inefficient to use it with a traditional hiring process of evaluating one candidate at a time. An assessment center solves this problem and allows you to efficiently perform evaluations en masse. By bringing all candidates and evaluators to one location, during one stretch of time, and by standardizing the hiring process, a large company can process many applications and fill many open roles within a short period of time. For large companies looking to staff up quickly or large recruiting firms looking for the most efficient way to find good candidates, running an assessment center streamlines the process. Unfortunately, assessment centers can’t solve all these problems without adding one major one. A massive administrative burden is something all companies want to avoid when hiring, but when you’re funneling your entire hiring system into one location for a week (or sometimes less), administrative burden can’t be avoided. The to-dos to make sure an event like this goes smoothly is enough to make any company cringe. The company or recruitment agency has to find a location to use, set dates which work for every recruiter to attend, have staffers welcome candidates and make sure everyone is in the right place at the right time, have all the proper paperwork available for every recruiter in front of them at the right time, and all that doesn’t even touch how to collect the data and process it appropriately. To complete these administrative tasks, companies have to contract out dozens, if not hundreds, of man-hours of effort, which was something once thought as an appropriate cost for the event. Make faster decisions and calibration sessions in terms of who are the best quality applicants as all the data is collected in real-time; and eliminate the need for recruiters and applicants to meet in one physical location by performing assessments over video conference. By combining these tasks, it is possible to create a digital assessment center that provides all the benefits of a traditional center, while dramatically reducing the administrative burden required to run one. Learn How to Digitize Your Assessment Center Today!